10 amazing stats you helped us achieve in the last 12 months! We crossed 37MM views on my YouTube channel. Overall, across our other sites, we had over 50MM video views in 2015 alone. You helped me cross 4 million fans on my main Facebook page. On average, 25MM people see my posts each week. You kept my iTunes podcast in the top 10 self-help for an incredible 80+ consecutive weeks! For a show without guests or sponsors (I just don’t want those lame podcast ads! ), this is sort of huge. I can only maintain it because of your support of my books and courses, so thank you! Oprah interviewed me for her latest O Magazine, on newsstands now. (January 2016 edition). I was also fortunate to develop a new online course with her OWN network, and thanks to your support it was a smashing success. Success Magazine ranked me in the Top 25 Most Influential, also out now. (Ummm… in Oprah Magazine and Success the same month!? So blessed you guys!). How’d they rank me? Because of my fan base, results and reach – YOU! Between 2014 and 2015, you kept my book The Motivation Manifesto on The New York Times bestseller list a whopping 30 weeks! You packed the rooms at our LIVE High Performance Academy seminars. Next one is in San Diego! Every book I recommended in 2015 hit the New York Times bestseller list. You guys love books! Over 300,000 of you completed a video series or online course from me this year. You love learning online! This month marked our 1 millionth online student to watch our video series or online courses! YOU succeeded, you grew, you shared your stories with me and all over the web. I’m honored to have such a thoughtful, inspired high performance audience. I love how you honor the struggle, strive to live your best life, proudly share your voice, care about inspiring others. Ultimately, hearing your stories is the only thing that matters to me on this list. I love and appreciate each of you, and I think of you daily when I write my posts and dream big things. Despite all these stats, I never forget where this all began. Please read my story below if you haven’t heard it. It hasn’t been an easy road. But even during the difficult times, with strong intentions to serve, a positive attitude, belief in ourselves, and disciplined focus and effort… well, we can all make a difference and find the magic and meaning of this beautiful life. Thanks again for a remarkable journey so far! I’m always honored to serve, and you inspire me daily. On behalf of my awesome team and family, thank you. In the photo on the top, I was bankrupt. I had just quit my corporate job to start my dream of becoming a personal development writer and trainer. It was ten years ago this year. Facebook, YouTube and iTunes were just a few years old. I didn’t know how to write or publish a book. I stayed up late each night teaching myself to build websites and do online marketing because I wanted to reach a lot of people with that very simple message. I was living in my girlfriend’s apartment because I was so broke. I wrote on a fold-out ‘desk’ borrowed from my mother’s old sewing room. 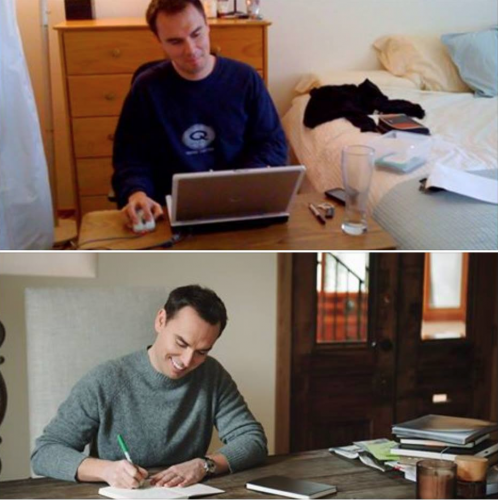 The apartment was so small that I used the bed as my extended desk, where I stacked all my bills and notes and fears. One night, I watched my girlfriend walk into the bedroom and, trying not to disturb me or my papers, quietly slip beneath the covers. I saw my woman sleeping under the weight of my bills. … or I was going to die with a smile knowing I followed that passion and purpose in my heart. I decided to marry that girl. And that leads to the other photo. The man sitting there is the same guy, driven by a fierce desire to live fully, love openly, make a difference. The haircut is the same, still bad. The grammar still struggles. The daily activity is the same: writing, pouring out my soul, trying to figure out how to say things that help and inspire people. All that has changed, really, is the venue and the platforms and the fans. Now my desk is bigger and nicer, and I write in one of my dream homes. As Facebook, YouTube and iTunes grew up, so did I. Now I’m “one of the most successful online trainers in history” (Oprah.com), “the highest paid marketing trainer in the world” (Success Magazine), and still “a very nice boy” (Mom). Every week, I receive some incredible invitation to speak at a conference, coach a celebrity, attend an awards show, interview a legend. Each invitation reminds me how lucky I am and always strikes me with awe. Now, over 50 million people have watched my videos – not easy considering that none of those videos have cats in them. Now, over 1 million students have registered for my video trainings or courses. Now, I’ve gotten to give back, from broadcasting free trainings to hundreds of thousands of people, to giving away over 100,000 books free, to funding scholarships, to mentoring and coaching others to become thought leaders in their own fields. All this began with me doing everything. Then as it got bigger, I got help. Now this all happens with just a handful of amazing team members, spread all over the country, who inspire me and cheer me on and are like family. Best of all, I’ve been able to help my friends and family, you guys, and millions who I will never know. It’s the greatest honor and blessing of my life. Because you let a little guy like me follow my dreams. YOU cheered me on and shared my work. You used my strategies and told people about them. You changed and grew, right along with me. At the beginning, there were just a few of you, five or ten. And then there were fifty. Then a hundred. Then a thousand. Then, as I just stayed with it for eight years every single day with full faith and joy and a dedication to excellence and service… well, here we are. Never limit the vision you have for your life based on your current circumstances or competencies. You are more powerful, imaginative, and strong than you imagine. I had no reason to believe that I could one day live my dream as a writer and trainer. No reason to believe, I suppose, except that my heart told me it was my path; except that my mind invented dreams that felt so real; except that faith said all the struggle and the hardship and the toil was worth the growth and contribution. Many of you know that Simon & Schuster actually turned down The Motivation Manifesto. They didn’t like it – yes, judgment always happens no matter your experience. They asked for their advance back. They said it was unpublishable, unmarketable; the tone was too different, too serious, not enough cute stories. But Hay House understood it, and the readers have spoken, giving it over 800 5-star reviews on Amazon alone. Yes, you will be judged and ridiculed and blindly accused of being insufficient at all turns in life. Your ideas, your dreams… you have them for a reason. Don’t give them up simply because someone’s uninformed opinion can hurt. Your fans, your real friends, they will have your back. Trust in that. Please, my friends, believe in your heart and your voice and your mission no matter what, no matter how small it all feels now. Never forget that growth and greatness often come from those seemingly endless, fruitless days and nights of faith and discipline. Keep working, keep at it, believe.